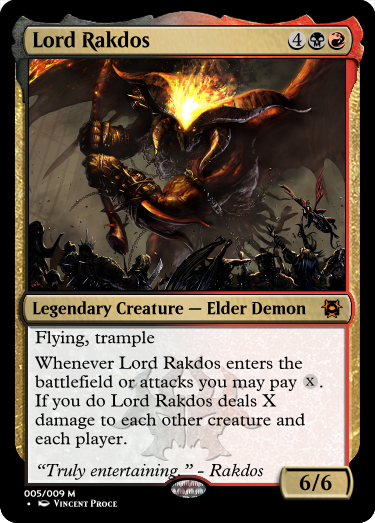 Design a card that has something to do with a guild of Ravnica. 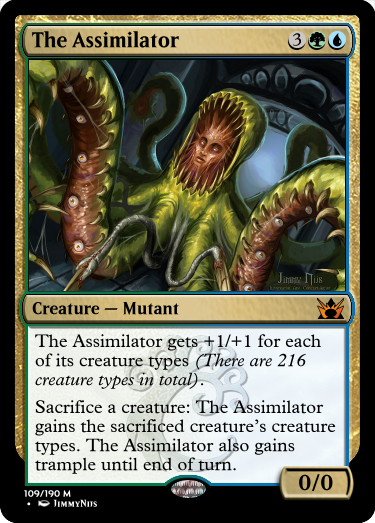 Whenever another creature you control dies, you may pay X life, where X is that creature's converted mana cost. If you do, return that card to your hand. "Some debtors are willing to pay quite a bit to ensure some debts somehow appear unpaid." 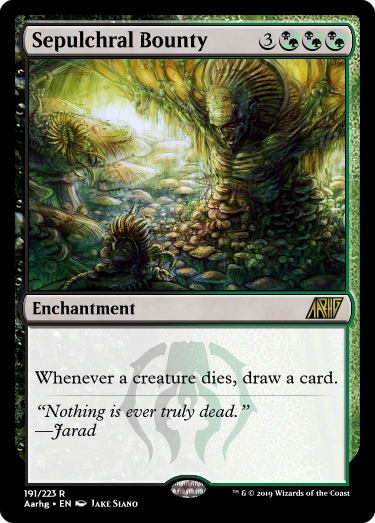 Creatures controlled by enchanted player can’t attack or block unless that player pays 5 life for each of those creatures. 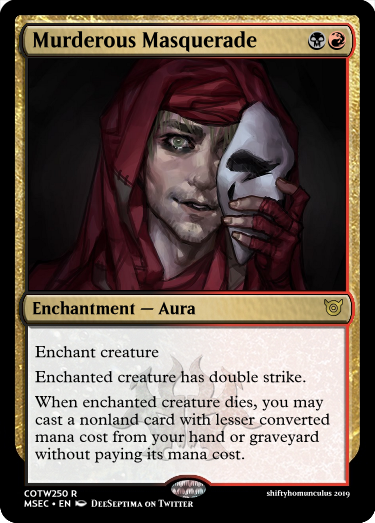 sade612: I really like this entry, it's a creative form of control that fits in the flavor of Orzhov, but can also fit within either White or Black colors. I wonder whether would be appropriate or not. The costing is fine, solid as-is, don't get me wrong. 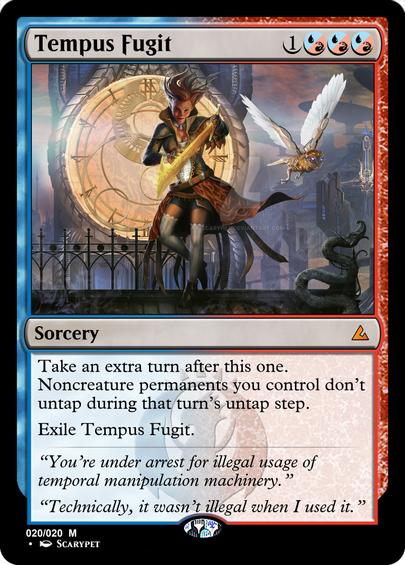 I'm always curious about thinking of alternate mana costs in order to push against limits. Sorry that I don't have really anything else to add, it's a solid card. 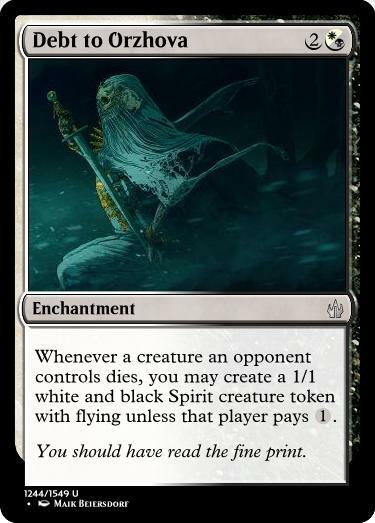 viriss: I found this to be an interesting take on the wrath concept that White, and Black, can be known for. My only critique is over the cost. 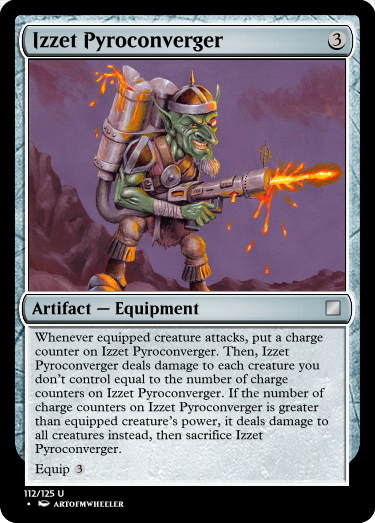 I can understand not wanting it to be overpowered, but the way it's set up makes it sort of jumpy in its effect, since you need a multiple of 3, as opposed to 2. 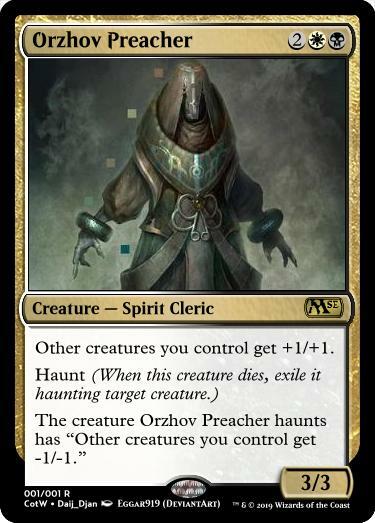 Either way, it works as-is, but I'm wondering if it would make more sense to instead have X be the number of creatures that you can target with the effect and just give each of them a straight-up "Afterlife 1." Then the cost could be . If you're really hoping to hit the multiplicative factor of an Afterlife trigger, however, is really too expensive? 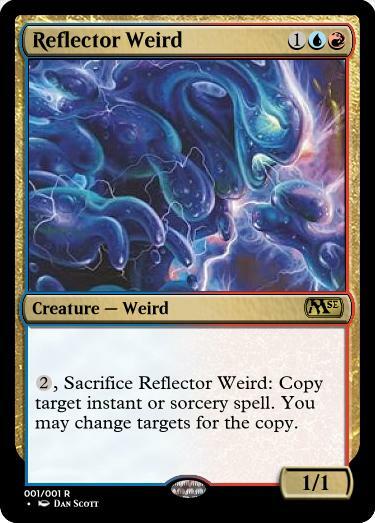 6 mana to give each creature afterlife 1, 8 mana to give each creature afterlife 2. I think it's worth pointing out that there are plenty of board-wipes targeted at low-cost, weak creatures. 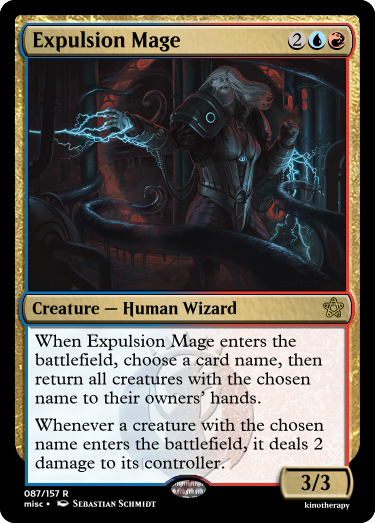 That was a lot of words to explain something that should be pretty simple, so I just wanted to finish with, the card is cool as-is. Take my thoughts like a grain of salt.